Featuring unavailable 4-track (A.N.T.) recordings from Beyond (Musab) and Atmosphere. Many live performances including some special live bootleg recordings. Reinforcing the words of Langston Hughes that “money and art are far apart” the sayers show that the real compensation for their art comes from the love of this culture and those who live it. Contains rare live concert footage from The Fugees, The Roots, and Goodie Mob show at First Avenue, Minneapolis (March 18, 1996). Cover art by local graffiti writer Abuse. The name of the crew had really started to spread locally and the hardwork is starting to pay off, the result is compensation. In the tape’s artwork you get the sense that they are feeling good and confident as ever; There’s a “poem” by S.T.R.E.S.S briefly outlining the crews growth, there’s promo info on upcoming albums by Atmosphere (“Overcast”) and Beyond (“Comparison”), and they have even added a P.O. Box and Fax Line. The tape features a collection of live performance audio and a couple 4-track demos. This time the focus is on Atmosphere and Beyond. The tape includes some tracks from those releases, but also several songs that are exclusive to this tape. comment "Headshots – Compensation: Vol. 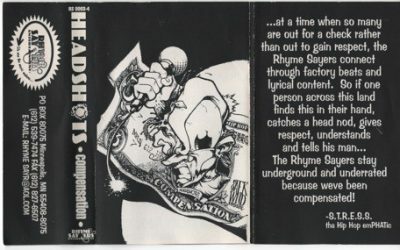 3 (Cassette) (1996) (320 kbps)"